The 2019 MLK Service Project was a HUGE success! Thanks to all those that volunteered and donated! Be a part of this great community experience! This year’s event is January 18, 19, and 20, 2020. Come out and help our seniors remain in their homes safely and comfortably, improving their quality of life. Thanks to all our generous sponsors. We could not pull off this event without your support! Dine at participating great Decatur restaurants on Tuesday May 14, 2019! A percentage of the day’s proceeds goes to the Decatur MLK Service Project, a large scale volunteer initiative to help low income Decatur seniors live safely, comfortably and affordably in their homes by: Completing needed repairs, Weatherization, Adding handicap accessible features and Yard Work. 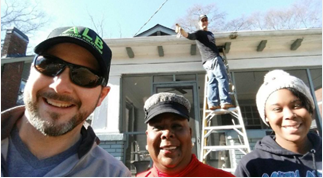 City of Decatur homeowners who are at least 62 years old may be eligible for help with home and yard maintenance and repair, free of charge, through the Martin Luther King Jr. Service Project. Since 2003, project volunteers have installed handicap ramps, replaced rotten wood, weatherized homes, repaired water damage and worked with professional partners to do plumbing, electrical, and HVAC work. The 18th annual project will take place on the weekend of Jan. 18-20, 2020. Other criteria include owning and residing in your home inside Decatur city limits and having a fixed or lower income. Contact Lee Ann Harvey, 678-553-6548, or leeann.harvey@decaturga.com, to sign up or to refer someone to this program. More information about the project is available at www.mlkserviceproject.com. Sign up for the official MLK Service Project newsletter!